Got a musical maven among your mates? Check out this line of super awesome fun cute home accessories from design shop Gama-Go, and yes, they ship to Canada, I checked. First up we have the Guitar Flipper, the gosh darn coolest way to scramble your beef or flip your flapjacks that I’ve ever seen. Made of silicone and conveniently dishwasher safe, it retails for just $12 and will definitely make you the talk of your next housewarming get-together. 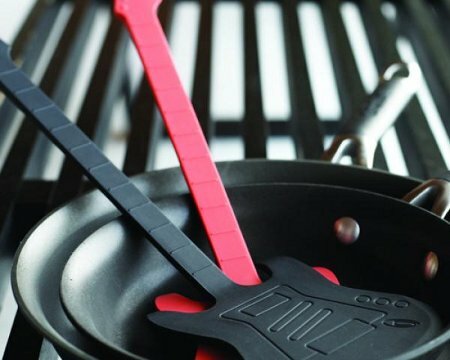 Be sure to check out the matching spatula for $10! 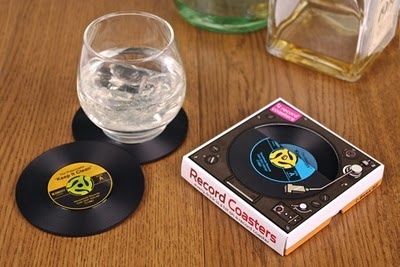 Moving on, these record coasters are the perfect way to add a bit of retro kitsch to your best friend’s coffee table. Again they’re washable, and double-again they’re affordable, at $12 for a four-pack. Plus they have their own mate in the form of a fun trivet that’ll light up the dining room table. 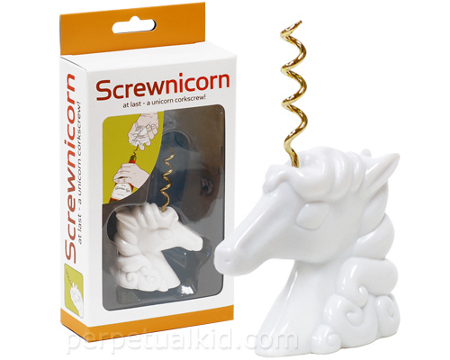 Finally it may not be musical but it sure is magical – the Screwnicorn is pretty much the crown jewel in the Gama-Go collection. Bask in its glossy white mane and golden nectar-opening horn, all for $10! Me likey. Honestly just go check out the site. They’ve got tons of cute tees and fun housewares like what I’ve highlighted here, including the ‘I Can’t Believe It’s Not Buddha’ butter dish and ‘Fortune Cookeys’ key toppers. Fun stuff for your closest friends or funniest acquaintances. The guitar flipper is awesome! Leslie should buy one for Nick since he does most of the cooking. Yes they do ship to Canada but it’s $25 flat rate! Hey Stephanie – it’s quite possible their shipping rates have changed since this post was published two years ago…in the meantime, I’d suggest stacking your order to make that flat rate hurt a bit less.